MainAll NewsInside IsraelA haredi mayor for Tel Aviv? A haredi mayor for Tel Aviv? Natan Elnatan, Shas representative in the Tel Aviv-Jaffa municipality, explains why he thinks he can beat incumbent mayor Ron Huldai. Natan Elnatan, the Shas representative in the Tel Aviv-Jaffa municipality, who announced last week that he intends to run for mayor, explained to Arutz Sheva why he decided to run against incumbent mayor Ron Huldai. According to Elnatan, until two and a half weeks ago the assessment was that Huldai, who has served as mayor for the last 20 years, would also win the next elections. But then his deputy, Asaf Zamir, announced that he would run against him, and at the same time MK Stav Shafir announced that she would run. "We saw that there are six candidates, and they all come from the left and the extreme left. For a Jew who observes Torah and mitzvot, and for a traditional Jew and a right-winger, there is no candidate he can vote for," said Elnatan. He added that "Huldai was the most likely candidate and today he is the [mayor], and we have no one to vote for. In Tel Aviv, 40% of the religious, haredi, traditional and right-wing public do not identify with any of the candidates." Elnatan said he received encouragement from rabbis and politicians who urged him to run. "Everyone told me, 'You have to run for mayor. If there are 40% who do not have an alternative against 60% who have six candidates, we have to present a candidate against the left.'" According to him, the city must undergo a change. "Tel Aviv has lost its rightful place. [City hall] says that that the concern for the residents has been our priority, but we have become a city that serves the brand, and today, when you open the municipality's website, you see festivals, events and parties." "What needs to be done is to bring Tel Aviv back to the residents, and the city of Tel Aviv, which is rich and has resources, will invest the money in the residents and especially in the residents of the south of the city." He also addressed the issue of illegal infiltrators in the southern part of the city. 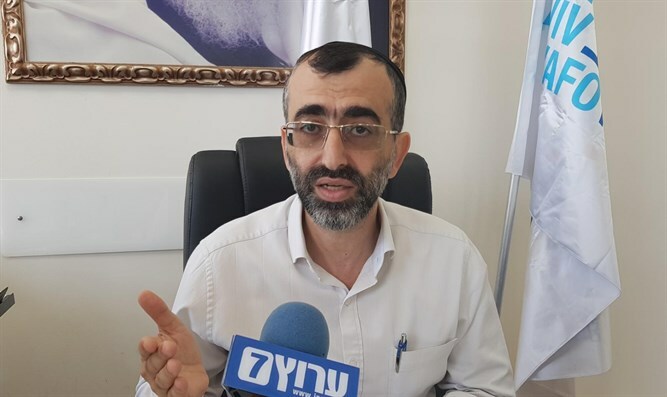 "The municipality has to invest less in the infiltrators, to give them the minimum that is required by law, while investing more resources in the Jewish community in south Tel Aviv." Elnatan was asked if he wanted to close the business in the city on Shabbat completely. "We did not seek to close the entire city and we have no intention of closing it," he replied, "but there was a status quo here for years. The places of entertainment and restaurants were open, and all the businesses and supermarkets were closed. I'd be happy to see that the whole city is closed, but I live in Tel Aviv and not in Bnei Brak and I know how to live in a mixed city."